This test has unsettled me. For the last few years, the Winner 9 has been the leader in her class. No other yacht around her size could offer her excellent combination of performance, price, build quality and customisation. Now Hanse has launched its 315, I’m not certain which boat is best. The hull of the 315 is reminiscent of Hanse’s sportier brand, Dehler, and she sails very well. But is she now top of the class? I’m not sure I know myself. A force 4-5 easterly whistled through Hamble Point Marina as we set off with full mainsail and self-tacking jib. She handled the conditions well, her grip in the water was excellent. Only when the mainsail was left sheeted as a gust hit would the toerail submerge and she’d gripe, but she has to be hard pressed even for that to happen. There’s a short stub of a transom behind the wheel, which gives some feeling of security. Our test boat was yet to have the fold-down transom and aft guardrails fitted, which I expect would remove the worry of dogs, children or helmsmen disappearing off the back without notice. With the aft cabin beneath it, the cockpit is slightly higher than normal, but unless you’re standing at the wheel it’s barely noticeable. Sitting to leeward, the pushpit makes a very comfortable backrest. On the windward side I was reliant on the grip from my bum on the coaming as the foot blocks were yet to be installed. (These will be fitted where the owner wants them, once she is sold). The feeling on the Jefa steering was delightful: light, with no slack or echo of movement from the opposite wheel. The danger with a steering system this good is that you find yourself waggling the wheels around to enjoy her responsiveness, which does little for her speed or your course, but it is fun. Her hull is designed by Judel/Vrolijk with an almost plumb bow and stern making full use of her 9.1m (28ft 8in) hull length. She only loses 40cm at her waterline. From aft it’s clear to see there’s less internal volume beneath the cockpit, making her waterline narrower. She has a foam-cored hull above the waterline, solid laminate below, and her deck is balsa- cored. The inner tray moulding makes up the seat bases in the saloon and provides recesses for the bulkheads. Nine bolts hold the deep, L-shaped keel in place. Her self-tacking jib makes the crew redundant during tacks. She had the optional Elvstrom FCL laminate jib and fully-battened mainsail with single-line slab reefing. The mainsail was on Seldén’s excellent MDS cars, the jib benefiting from vertical battens near the head, which stop the top of the leech falling away and flapping with a frequency from Harley Davidson to Vespa, depending on course and wind speed. Halyards and jib sheet are controlled by the two Lewmar 40ST winches either side of the companionway. There are two others further aft, which can be used for a German mainsheet system or for offwind sails. The cockpit locker to port is a good size, it’s hull depth, but where the moulding from the aft cabin beneath impinges on the locker it actually makes a good shelf. There’s washboard stowage at the front that looked vulnerable to attack from dinghies or fenders. The cockpit coaming isn’t the most supportive, but it’s nice and wide to sit on or comfortable to rest against. The pick of the seats is a lovely rounded and reclined seatback at the aft end of the coachroof. Even withoutthe luxury of a cockpit cushion it was still snug and comfortable. Stepping over the wide coaming onto the deck, there are short handrails to help you to the swept- back spreaders (with chainplates taken to the toerail) but nothing further forward. It’s still a short distance to the mast, so longer handrails would have been nice. There are two interior layout options and having been on board both, it is a tough decision; both have advantages. Without the forecabin door, but with a large aperture in the forward bulkhead instead, you have a vast saloon area giving space and light. With the full bulkhead and door you have privacy and cupboard stowage. Your choice will depend on your circumstances; either way there is still a large, athwartships berth (with a minimum size of 1.93m x 1.65m) in the fair-sized aft cabin. One of the reasons for my indecision is the clever use of space in the forecabin if you opt for the bulkhead and the three- in-one layout it gives. 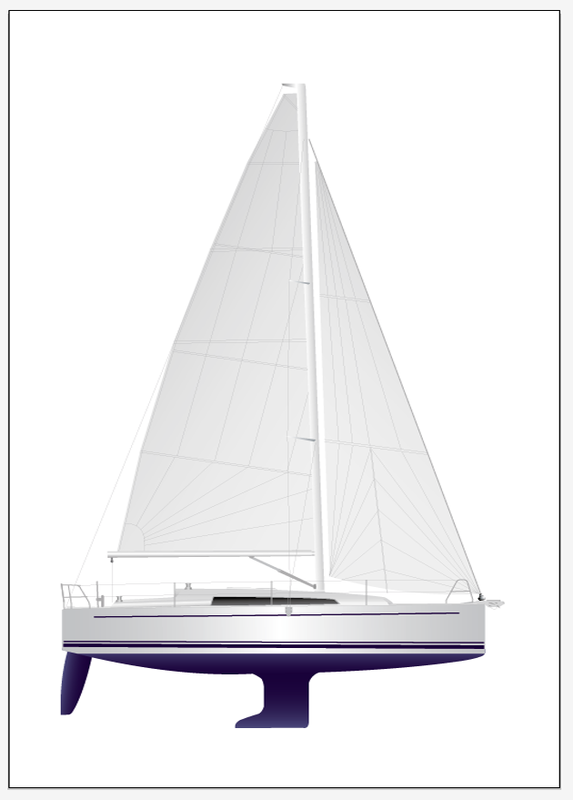 The first layout is a standard V-berth (2.05m long x 1.55m at the head, 0.66m at the foot). But lift the port-side cushion and a hinged board lifts and folds back, revealing a neat seat in the inner moulding, complete with cushion and backrest – and you’ve still got a full-sized single berth. Lift the smaller starboard cushion, slide the bunk base under a locker and you now have a 1.39m long children’s double berth. There is the question of what to do with the excess cushions: personally I’d relegate them to the oversized aft berth. Sadly, if you opt for the open-plan interior, this innovative solution is done away with and the berth is full width and fixed. She has the touch-panel light switch found throughout the Hanse and Dehler range, so the lights can be programmed or dimmed – rare on this size of boat, as are LED lights in the recess of the overhead handrail. The reading lights on stalks are also worth mentioning as they can be switched to red or white. 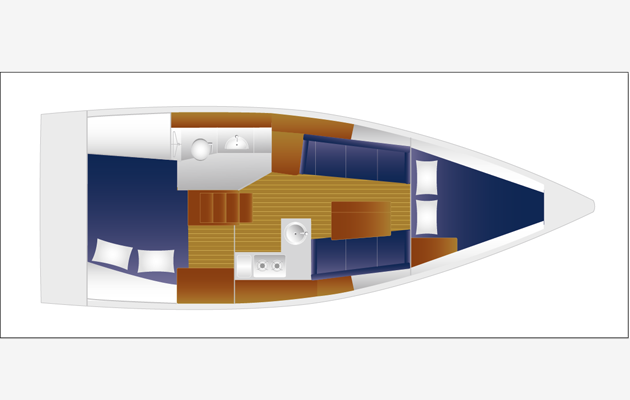 The saloon is a small (11cm) step up, the port-side seat is 1.93m long and would make a good sea berth with a leecloth added – and you will need one, because the starboard-side seat is a bit too short (1.65m). Although it’s possible to sleep five, the saloon table again is a little frugal at 0.84m long, best suited to four diners. The headroom is 1.74m (5ft 8in) in the saloon. Although there are overhead handrails I felt a grab-handle aft of the chart table at a more accessible height would be an advantage, but any owner could easily add this. The chart table has a minimum size of 0.65m x 0.51m and can be used seated, facing aft (beware of the corner by your thigh) or standing, facing outboard. Opening the switch panel reveals a bundle of wiring all labeled with words, far better than the usual code numbers that have to be deciphered. There are two bottom-hinged lockers outboard, and bookshelves will be added outboard of the saloon seating. The small L-shaped galley is a good height to work and wash up at the single sink but the stove really needs a crash bar, because accessing the top-opening fridge on a port tack means leaning against the cooker. The galley lacks workspace and stowage – the fiddled shelves outboard of the stove are OK, just. One could say these details should be corrected, but she’s built to an attractive price. Hanse said she’s more expensive than they had planned, but she is a better boat. Access to the engine is from the front or either side. Topping up the saildrive gearbox oil wouldn’t be the easiest of jobs, but neither is it impossible. A single 90Ah service battery is under the starboard saloon berth (a second is optional). The battery charger sits under the port berth. All seacocks have neat slides on the handle to prevent them opening by accident. What’s she like to sail? She’s a very easy boat to handle, thanks in part to her simple self-tacking jib arrangement. Twin wheels on 31ft yachts seem here to stay, although she is available with a tiller, which keeps her cost down – but only one of the first 10 owners have opted for one. The Jefa steering is as good as it is on many bigger, more expensive boats; it was light, silky smooth and responsive. The leather-covered wheels were comfortable to use. The cockpit sole occasionally felt a little high but this was minor and easily forgotten because the way she sails is very good indeed. The mainsheet is ideally located between the wheels (but a German mainsheet or traveller are options). It was easy to brace a foot on the table and heave in the sheet, or ease it out in gusts. Not that the mainsheet needs much attention: only when water was washing down the side deck did she show any sign of disobedience – the angle of heel and increasing weight on the wheel gave fair warning well before we reached that point. What’s she like in port and at anchor? Her single and substantial bow roller sits well proud of her vertical bow. The chain locker is deep, with stowage for fenders and plenty of chain for coastal cruising. She’s manoeuvrable and will turn well in tight spaces. There is a fair old distance between her saildrive and rudder, which causes a bit of delay between applying thrust and it being directed by the rudder, but it’s predictable. The forward end of the cockpit was made for lounging: back to the coachroof, looking aft over the transom and anchorage – perfect, for two people at least. Down below, the galley worktops are higher than usual, thanks partly to the sunken floor (to gain headroom) but it’s actually a comfortable height to work at. The heads is a large, all-in-one GRP compartment with a built-in shower and space for hanging oilskins; it works well. The saloon is bright and benefits from simple, neat design. The open-plan option, which does away with the enclosed forward bulkhead and door, increases the feeling of space – something often lacking on smaller yachts. Would she suit you and your crew? In the past, it’s fair to say that accommodation was a higher priority for Hanse than sailing performance. While the 315 hasn’t crossed over to being performance-orientated, she strikes a good balance. She might not have the interior quality of a few other boats in her class, but neither does she have their price tag. 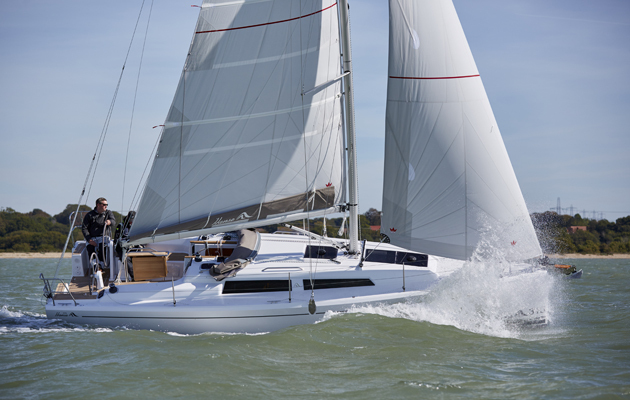 She benefits from Hanse’s bulk-buying power and technology trickling down from its other models. She starts off at a low price (£70,000 Inc VAT), then options help you tailor her to your requirements and your finances. She’s available with twin wheels or tiller, shallow keel or deep. The galley and chart table are the only compromised areas and even they aren’t off-putting. The saloon is good, as are the cabins and cockpit, but she could do with a few more grab handles and a crash bar at the galley. 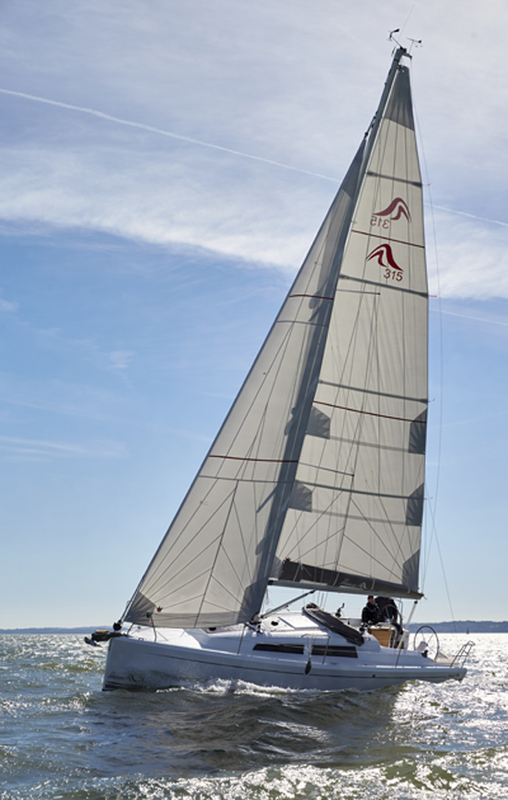 She’s a versatile boat, the Hanse 315. A good buy for anyone starting out with their first new boat, or downsizing from a larger yacht. If coastal cruising is your main aim – unless you have a large, grown-up family or crew in tow – she’ll make a great boat to do just that.